This is Arkusz by *Grojor out of Anielka. He is one of the first Arabians I knew more personally (and these are my first pictures of an arabian!). His owner was a friend of my mother. This picture is taken at the stallion licensing at Romme. I got time off from school to go there so it was a very big thing for me. I was 12 years and Arkusz 4 years. He is a 3/4 brother to the stallion Azir by Ciemny. Arkusz Anielka comes from the family of Sahara OA, a Kuhailan strain. Sahara was imported in 1845 along with Gazella OA and Mlecha OA to Jarczowce. The only direct line from Sahara OA is that from her daughter Sahara Slepka OA who was foaled in transit. Many members of this family perished in World War I and only two mares were saved, Pomponia 1902 and her daughter by Kohejlan OA, Zulejma 1914. After the war Pomponia had two more daughters, Dora 1922 by Bakszysz and Bona 1920 by Mazepa I. Of the postwar daughters, only Dora had any impact on the breed. Anielka belongs to the branch of Zulejma 1914 through her daughter Ferja 1924. Zulejma was also the dam of Dziwa (mother of Ofir), Huryska (granddam of Epizoda), Kahira and *Lassa. This is an impressive family that has produced both great mares and great stallions. 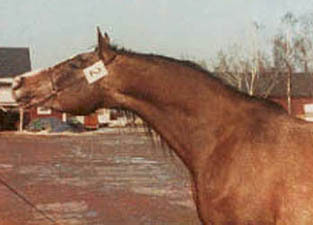 Ferja was the dam of Magja 1931 and Norma 1932 (the dam of Nureddin). Magja was dam of Imatra 1936 (dam of several broodmares and granddam of Ilbor, leased to Sweden) and Kaszma 1939. Kaszma was the greatgreatgreatgranddam of *Areka. 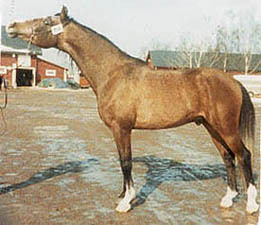 Other horses of swedish interest from this family (through Ferja) include the stallions *Krezus, Bilbao, Ilbor, *Tryptyk, *Erystawi and Nureddin and the mares Karramba (dam of Karillon, Kharana and Khizil Kum), Biruta (dam of Batsheba), Gehenna (dam of Dido), Mimonka imp Sweden (dam of Mimoza and granddam of *Mimikra) and Tryfolia.